Jones, Lamson & Co. was founded in 1869 as a reorganization of Windsor Mfg. Co. by Ebenezer G. Lamson and Russell L. Jones. Lamson had bought the plant and equipment of Robbins & Lawrence Co. in 1859. This firm evolved from the historically important Robbins & Lawrence Co., early innovators in the "American system" of mass producing rifles. That business failed in 1856. Their works were purchased in 1861 by Lamson, Goodnow & Yale, which reorganized as E. G. Lamson & Co. in 1864 and again in 1865 as theWindsor Mfg. Co. In 1869 the works were purchased by Jones, Lamson & Co. The principals were Russell Jones and Ebenezer G. Lamson. Their firm operated cotton mills, manufactured guns, and also made machine tools for making guns and sewing machines. They also made general-purpose machine tools. Of relevance to this website, they made Lane's patent circular sawmills, drill presses, and wood-turning lathes plus metalworking machinery. In 1878 the company name changed to Jones & Lamson Machine Co. In 1888 they relocated to Springfield, Vt. Remarkably, they are still in business although they have not made woodworking machinery for probably over 100 years. They now go by J & L Metrology and specialize in making optical comparators. From about 1912 until the 1950s, Jones & Lamson made the "Fay Automatic Lathe", which was used for production turning between centers. Originally developed by F. C. Fay of Fay & Scott Machine Shop, the design was improved by Otto Schaum and then, after the design was acquired by Jones & Lamson, by a team led by Ralph Flanders. The Fay automatic lathe was a significant advance in production turning that was made obsolete with the development of CNC. Bourn & Koch, Inc. is now the OEM for the Jones, Lamson & Co. metalworking machinery side of their business (not the inspection equipment). You can link to their website at the Bourn & Koch web site. From the 1874 work, Wiley's American iron trade manual of the leading iron industries of the United States : "Windsor Manufacturing Co.—Jones, Lamson & Co. Machinery, lathes, drill presses, milling machines, etc." It is interesting to trace the history of our manufacturing establishments, and see what vicissitudes and changes have attended many of them, until by contributions from successive owners, or by changes of times or employment, or by judicious management, the latest holder acquires an enviable position in the business community. Such has been the case with the works of Messrs. Jones, Lamson & Co., of Windsor, Vt. This establishes was begun by Messrs. Kendall & Lawrence, custom gun-smiths. In 1845 they made 10,000 rifles for the United States army, under the firm name of Robbins, Kendall & Lawrence; two years later, they were incorporated as the Robbins & Lawrence Co., and in consequence of the excellence of arms exhibited by them at the first World's Fair in England, they were employed by that government to furnish a set of machinery for the Enfield Armory, and 20,000 Enfield rifles. This machinery was the first introduced into that country for making guns with parts interchangeable upon the American plan. They also made a full set of machinery and tools for the Sharpe's Rifle Co., Hartford, Ct. By a complication of circumstances the Robbins & Lawrence Co. failed in 1856. The works were purchased about 1861 by Lamson Goodnow & Yale, and were employed by them and their successors, the Windsor Manufacturing Co., in manufacturing machinists' tools and arms. During the late war, more than 60,000 guns were made here. In 1870 the works were purchased by the present firm of Jones, Lamson & Co., who found it profitable to change the main buildings into cotton mills. They are now running in their cotton mills 12,000 spindles and 224 looms, and employ in them and their machine-shop an aggregate of 200 hands. That a single house should turn out the number of different machines as that of Messrs. Jones, Lamson & Co., of Windsor, Vt., is surprising. They make among other the following first class machines; all in the very finest manner and at very reasonable prices: Clamp Milling Machines, Screw Milling Machines (6 sizes,) Small Trip Hammers (iron beds,) Screw Slotting Machines, Tapping Machines, Press Drills (4 spindles,) Press Drills (3 spindles), Die Sinking Machines, Edging or Profiling Machines, Rotary Stamping Machines, Squaring-Up Machines, Counter Boring Machines, Polising Machines (Ball's Patent,) Bullet Lubricating Machine (Ball's Patent,) Lane's Patent Circular-Saw Mills, Dutcher Looms, Iron Planers, Shaping Machines, or Compound Planers, Engine Lathes, Hand Lathes, Chucking Lathes (3 spindles) Chucking Lathes (6 spindles,) Breaching Machines, Hot Trimming Machines, Common Milling Machines, Index Milling Machines, etc. From the official catalog of the Centennial Exhibition of 1876, under the list of exhibitors of metal-working machinery: "Jones, Lamson & Co., Windsor, Vt.—Engine lathes, screw machines, gang drills, etc." Messrs. Jones, Lamson & Co., of Windsor, Vt., have some very attractive engine-lathes, screw-milling machines, drill-presses, etc., among their display, some of them of new patterns, and all possessing more or less improvements. One of the engine-lathes for screwcutting exhibited is a very pretty tool; it has a 14-inch swing with a 4 1/2-foot bed, and though not large, looks like a worker. Among the leading features of this lathe are the arrangements by which the stud quadrant at the end of the head-stock can be so shifted and fastened that the stud-gear will operate either the screw or the feed-rod; the hand-wheel in front of the head-stock may be so turned that, according to its position, it will reverse or stop the stud-gear, and consequently the carriage. By means of this simple arrangement a single stud-gear answers both for feeding and for cutting right and left hand screws, and any stud-gear may be obtained for turning. In this machine the friction arrangement for fastening the spindle-cone to the large gear is especially convenient, while the spindle itself is made tubular, so as to admit of working wire or bars through a chuck. Then there is a 4-spindle press-drill for gun and sewing-machine work, of a new pattern. This drill being without gears, is almost noiseless. Messrs. Jones, Lamson & Co. also show some screw-milling machines or turret-lathes, which have many points of excellence. Their whole display is very creditable. The December 1912 Mechanical Engineers Catalog and Product Directory has an ad from Jones & Lamson Machine Co. for the Fay automatic lathe. The Wikipedia entry on the Fay automatic lathe provides a good overview of that product. The American Precision Museum website has a biography of E. G. Lamson. 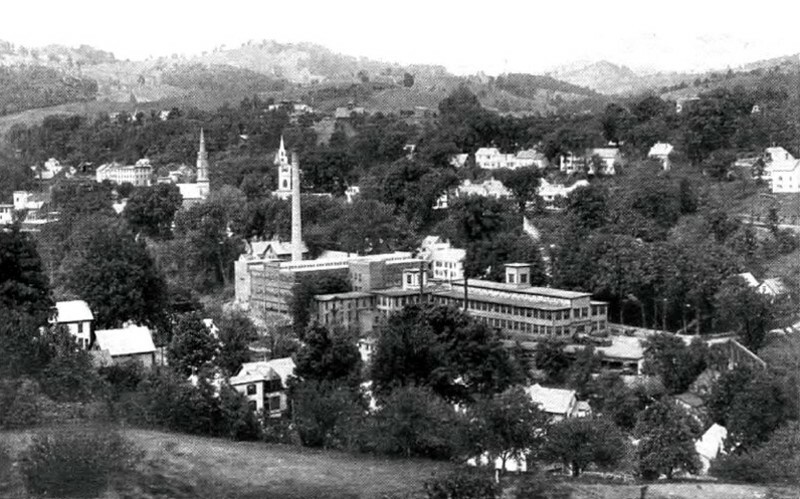 Recent history is from an article by Madeline Bodin in the January 1995 issue of Vermont Business Magazine .